I'm a big fan of large speakers. In my experience they present an easier load to the amplifier, and more effortlessly fill a room (particularly a larger room) with plenty of volume, and provide the scale to make performances appear more lifelike. But, of course, many audiophiles don't have a large listening room, and require smaller speakers. There's almost always some sort of compromise with smaller speakers, usually with regard to the amount (and quality) of bass. So I'm always interested when we are offered smaller speakers, to see how much of a compromise they are going to be. The contenders in this review come from Italy, and are manufactured by Audiofilia, a company that I had not heard of prior to this review. The model supplied for review was the AF-S2, a reasonably compact ported speaker using ribbon tweeters and 6 inch woofers. They are not cheap at over 2000 euros a pair, and as I awaited their arrival, I wondered if they could justify their price tag. On unpacking the AF-S2s, there was nothing too special about their physical appearance. They consist of a regular rectangular cabinet, 19 cm wide, 29 cm deep, and 30 cm tall. 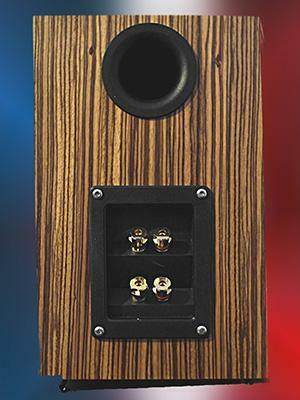 There's a 5 cm diameter port that exits to the rear of the cabinet, and gold-plated bi-wire terminals, again on the rear. They are neatly finished in what looks like real wood veneer, but I did wonder, given the price, why the drive units were not recessed flush into the face of the cabinet. Those sharing their listening room with a fastidious 'other half' should also be aware that no grilles are supplied. Audiofilia later sent me a link to their site with the details of how their 'S' range of speakers are conceived and built. They consider that all musical instruments that are built using wood, use timber carefully selected to give the best possible sound. So they adopt the same policy, even insisting on not using laquers or glues that may change the acoustic qualities of the materials used for their cabinets. 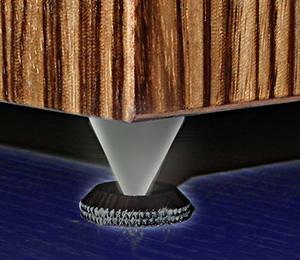 So I presume that what looks like real wood veneer is actually real wood! Audiofilia was quite insistent on how the AF-S2s were set up. Rather than sitting with their base flat on a shelf, or top of the speaker stand, they are designed to sit on four metal cones (supplied with the speakers) that screw into the base of each cabinet, thus decoupling them from the stand. The point of each cone sits in a small metal disc. 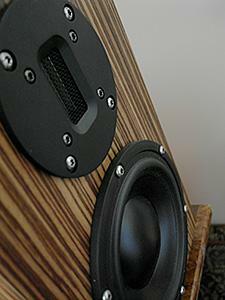 This is to allow the whole speaker cabinet to 'sing' rather than trying to completely deaden the sound from the cabinet. Audiofilia claim that this enhances the sound. I used high stands for these speakers, raising the tweeters just above the level of my ears when I was sat in my seat. As an experiment I started off with the cabinets minus their spikes, and then added the spikes. What Audiofilia claimed was easily discernible, ie the AF-S2s sound a whole lot better with the spikes decoupling the cabinets from the stands, and allowing the whole cabinet to 'sing'. So that's how they were set up for the course of the review. The next job was to find the optimum position for each speaker. Being on the smaller side, I started off with them fairly close to the wall behind to give the bass output some support. With the rear firing port this was a mistake, and I started to bring the speakers further away from the wall. What did surprise me was that it wasn't until I had got them 30 cm forward of the wall that the bass sounded right. If I bring my larger MS Pageants with their larger 8 inch woofers that far forward, I lose quite a bit of the bass output. And yet the smaller AF-S2s lost nothing in the bass frequencies, and the quality of the bass improved substantially. As a bonus, the depth of the sound stage got deeper as well. It was then just a case of moving the speakers laterally to find their optimum location. The supporting cast for the review consisted of a my audio PC running Audiophile Linux and JPlay (in Windows 8), three USB DACs, the M2Tech hiFace DAC, and the iFI iDAC. I started off with a Gainclone chip amp, but found that it was so revealing with the ribbon tweeters that it eventually became tiring to listen to, so I replaced the chip amp with the Yarland FV-34C valve amplifier that proved to be a match made in heaven. By the way, the S2s are not a particularly difficult load for an amplifier but they won't run on 'flea power'. I did try them with the tiny Miniwatt N3 valve amplifier that has just 3.5 WPC. It did work until the volume was turned up anywhere near to full, when there was audible clipping. I had asked Audiofilia to supply a burned in pair of AF-S2s so with everything connected I was ready to audition. Right from the outset, I was pleasantly surprised by the performance of the AF-S2s, particularly regarding the bass. I was left wondering how such small speakers could go so deep. But it wasn't simply the depth, it was the tunefulness, the speed, and how well (once the speakers were located properly) it integrated with the rest of the music. And even when I upped the volume to levels that I would only use while my neighbours were out, hardly anything ever excited room modes. In other words I could play as loud as I wanted with any nasty booming sounds. In my smaller auditioning room that is around 3 metres by 3 metres, the AF-S2s had no problem at all supplying all the bass that I wanted, no mean feat for such small speakers using 6 inch woofers. Bass lines were easy to follow, in fact, as easy I have heard. But it was the speed that was addictive. My usual test track of Paul Simon's 'Graceland' passed with flying colours, but one of the stand out tracks was Yellow's 'Resistor' from their Pocket Universe album. It was literally like having a machine gun in the room! Some of the tracks off the Talvin Singh album, 'Ha' were played as well as I have heard from any 'box' speaker, and again the depth of bass that the AF-S2s played was almost unbelievable. Of course, such small speakers can't produce that last octave of lower bass, but they pull off the trick of sounding so good, that I didn't miss it. If I owned the S2s I wouldn't feel the need to add a sub woofer to the system, at least not for music. But what about the rest of the frequency range. Well, not surprisingly, those ribbon tweeters are highly revealing, and bring out just about every detail from the higher frequencies. On some tracks though, there could be just a tad too much 'tizziness' that drew my attention to the speakers. That may have been due to the quality of the recording though and didn't happened very often. Apart from that, the AF-S2s simply disappeared into the sound stage leaving a wall of sound. That sound stage was wide, extending beyond each speaker once they were positioned correctly. I've already spoken about the depth of sound stage with the speakers so far forward of the wall behind them. With the pinpoint imaging, this all presented a very accurate sound stage, and with the clarity of the midrange, often made a performer 'appear' to be in the room. I spent many hours with my eyes closed enjoying that illusion of having the likes of Stacey Kent, Diana Krall, Helen Merrill, and Natalie Merchant, to name but a few, giving me a personal performance in the privacy of my room. Performers and instruments were always well separated too. At this point, I removed the solid brass links from the terminals of the S2s and used a second set of speaker cables to bi-wire them. I found this made quite an improvement. It's never a bad idea to decouple the tweeter from the woofer when possible. It's always difficult to measure how wide the 'sweet spot' is in a small room, but I could certainly move a few feet in either direction from my listening position in the central part of the rear wall. I should add that I prefer speakers facing forward rather than towed in. If you wonder why, play an album like Roger Water's 'Amused to Death' featuring Q-sound effects, while listening with your speakers facing straight forward, and then with them towed in. When I tried my test for linearity, using the Q-sound effects on Roger Walters album 'Amused to Death' I found that they weren't quite projected as far out into the room as they are with my MS Pageants, or the Alacrity Audio Caterthun speakers. I don't know if that was due to the smaller woofers in the AF-S2s or the design of their crossovers. There wasn't much in it though. I sometimes hear these effects, i.e. where the sound comes from well out into the room, in some other albums. Deep Forest's 'Boheme' is one that comes to mind. While auditioning the S2s I was listening to Fleetwood Mac's 'Little Lies' track and for the first time heard the backing vocals coming right to my end of the room. No doubt, being able to situate the S2s source far out from the wall behind them is the reason that they present such a three dimensional sound stage, and emphasise these Q-sound effects. That is no mean feat for a small speaker in a small room! At this stage I contacted Audiofilia for a bit more technical information. It transpired that due to the language differences, the speakers had not been supplied burned in, but only tested. Audiofilia suggested that I give the S2s another 40-50 hours to hear them at their best. And they were right. As time went on, that 'tizziness' in the top end seemed to go altogether. The bass improved even more, and over all, the enjoyment of listening to the S2s grew and grew. Audiofilia also told me that they employ some kind of trickery to enhance the bass output. Perhaps trickery is the wrong word to use but they do something that obviously allows the S2s to sound much more like a larger speaker as regards the bass output. That reminded me of the Caterthun speakers that I reviewed last year, that also pulled off the same trick. The main difference between the two was that the S2s could be (should be) pulled well clear of the wall behind them, while the Caterthuns required close proximity to the wall to support their bass output. This gives the S2s a clear advantage in terms of depth of sound stage. The AF-S2s played anything that I threw at them with style. Pop, rock, jazz and classical. The only area where I could honestly criticise them was when playing large scale orchestral music, or other music where the scale is important i.e. film soundtracks. These smaller speakers just couldn't reproduce that level of scale that makes some music so moving. For instance, the soundtrack album from the film 'Gladiator' just didn't have quite the same impact that it did with the larger speakers. But, with other types of music featuring a solo performer or instrument, the scale was excellent with some performers and instruments 'appearing' as life sized. If you want a rock concert in your small room, then the S2s are just the ticket as I discovered listening to the likes of Rory Gallagher and Carlos Santana. The quality of the percussion (with the well-defined bass) is probably a big contributing factor. The heart beat featured on the opening track of 'Dark Side of the Moon' had never sounded so real. Piano sound had good weight making it sound more real. With acoustic music like Jackson Browne's 'Solo Acoustic' album, the delicacy, and richness of tone of the guitar notes added to the enjoyment. I also noted that familiar voices like those of Karen Carpenter, Richard Burton, and a friend of mine who has just released her own album, were portrayed very accurately. Metallic sounds such as cymbals and triangle were also very realistic. Violins never presented any problem with sounding too harsh on those ribbon tweeters. Overall, I very much enjoyed the AF-S2s and would thoroughly recommend them to anybody looking for a smaller speaker. Just about every genre of music sounded enjoyable, with only large scale orchestral unable to match the output of larger speakers. The S2s retain their qualities at lower listening levels, something quite important if you do a lot of late-night listening. Do remember though that these are not bookshelf speakers, they will require a pair of decent stands, and need to be situated well forward of the wall behind them, i.e. out into your room. While listening to them, I couldn't help but think that many larger floor standers wouldn't necessarily take up any more space in my room. That said, the AF-S2s are so good that they deserve consideration in their own right, almost regardless of size. 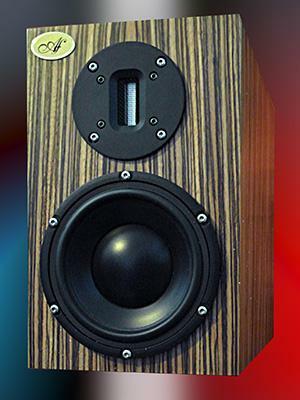 In smaller listening rooms, it would, in my opinion, be hard to surpass their performance in such a compact package. They don't just sound very good, they are one of the most fun, and enjoyable, speakers that I have ever heard in a smaller room. Simply put - the best small loudspeaker that I've heard.